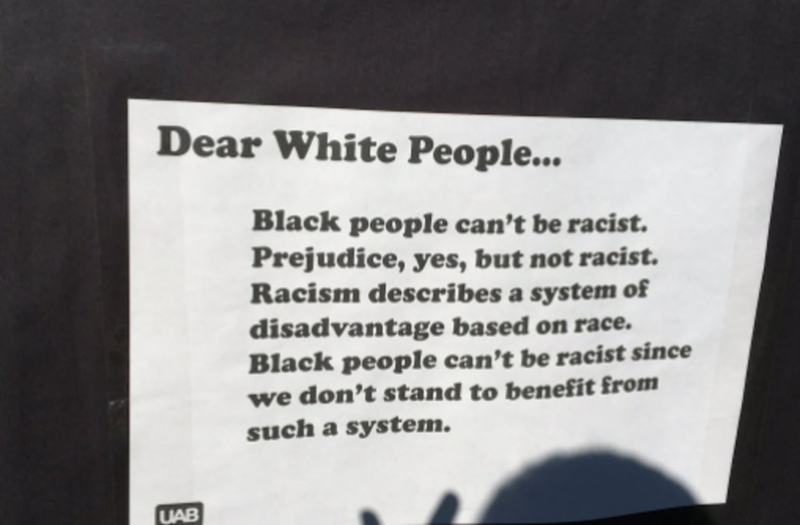 A student organization's on-campus demonstration spearheaded with the phrase, "Dear White People", has non-black students up in arms about its "racist" critique of white people. As part of the school's "Diversity Education Week," the Union Activities Board at North Carolina State University posted "Dear White People" signs, in conjunction with holding a day-long campus viewing of the controversial film, across the campus saying that white people were "perpetuating racism and white supremacy" by "colorblind." "Black people can't be racist," one sign read. "Prejudice, yes, but not racist. Racism describes a system of disadvantage based on race. Black people can't be racist since we don't stand to benefit from such a system." Another sign insisted that white people who said "African American" wanted to use the racial slur, "n*ggers," instead. "In a shocking reversal using the term 'African-American' is borderline racist now," the UAB stated on one of their signs. "It turns out if you're too worried about political correctness...to say 'black,' odds are...you secretly just want to call us n*ggers anyway...and truth be told, I'd rather you just be honest about it." Another poster noted the success of media proprietor Oprah Winfrey in a time where author and self-proclaimed "right-wing polemicist" Ann Coulter can publish books that become best-sellers, while "black kids are still getting shot for wearing hoodies." "Dear White People ... are you tired of your humdrum, Wonderbread existence of accidental racism and wishing you could sip on Henny out yo crunk cup without a b*tch giving you the side-eye?" asked the last poster. "Course you are."